Read our introduction to this series. We believe love heals through God’s people! 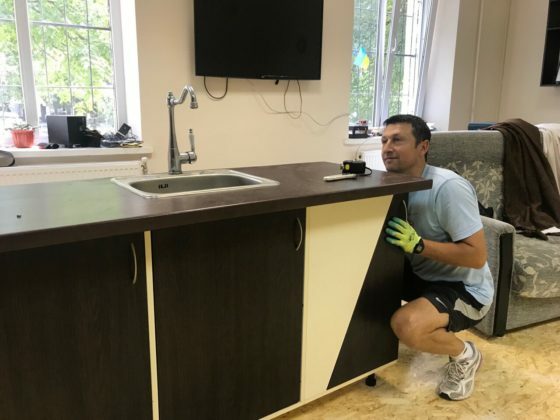 Sergei Cherniy works as the head of Last Bell’s newest program, the Restoration Project, where a crew of our youth learns job skills while restoring the homes of their fellow orphanage graduates. Many thanks to Yulia Nesterenko for her Skype translating! LB: How did you first learn about Last Bell? What is your role on staff? Sergei: My Anya worked for Last Bell as a nanny. I already organized a soccer team for guys, and as a volunteer I invited guys from Last Bell. [Now] I’m a spiritual leader for the guys… I also teach them how to understand a profession – how to build, to fix. I work with our guys, help them do the work and plan. I take responsibility for their technique… I buy different building supplies. I help in different programs at Last Bell, and in the camps for moms. Sergei: My wife Anya works at Last Bell. We have two children. Masha is married now. Matthew is in 7th grade. We have been married for 20 years. We built our private home together. We have a piece of land for gardening and I help Anya with different plants and trees, fruits and vegetables. Also I’m a volunteer at our church; I’m an assistant to our pastor, I preach, and I lead prayer meetings and Bible study group. Before Last Bell I was a Physical Education teacher for 21 years. LB: I already know some of the technical skills you bring to Last Bell, but what about you, your personality – what do you bring to the team? Sergei: I try to be a good example. I invite the guys to our home to show them the atmosphere of our home and family. And of course I’m like a spiritual leader; I try to teach them God’s Word. Once every three months we have retreats, a day of rest – barbeque, river, swimming, a picnic. I try to understand our guys, their actions and their situations. Sometimes they ask to miss a day, and I let them go, to rest or solve their problems. I trust them with money and different technical tools, which brings us closer. Of course… there is some discipline too, and I can see good changes. Sergei: When the day starts, Anya and I go to the market to buy different things for the Shelter and Restoration Project. We arrive at the Shelter earlier than the guys. We have breakfast [with the guys], and we have a Bible hour together and plan our day. We leave Anya at the Shelter and the guys and I go to the project we’re doing. Then we have lunch at the Shelter. There are some exceptions. When we work at the villages, we usually stay overnight there and cook for ourselves. In the evening I bring the guys to the Shelter. They have a shower and tea there. That’s the end of our workday. Sometimes we have repair jobs at the Shelter. LB: Do you feel a call from God to work with orphans? How would you describe the way orphan care is part of God’s kingdom and His purposes? 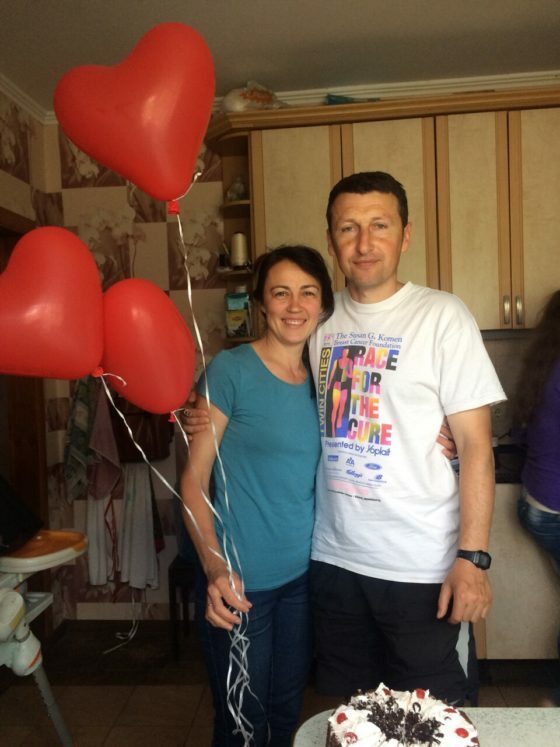 Sergei: …I believe this was God’s calling for me, even when I got my education as a PE teacher. 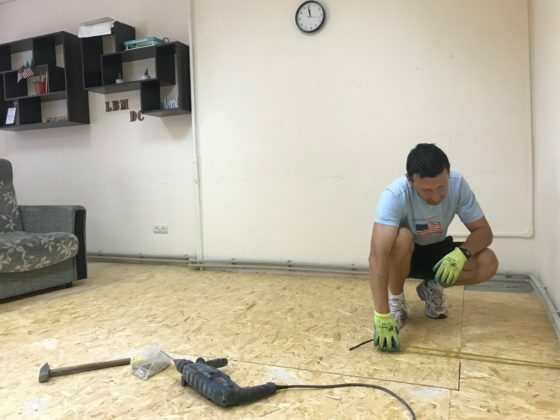 I had a good experience working at the school, and it helped me a lot… to understand guy orphans and mom orphans, and then I saw it was interesting to do something connected with renovation. LB: Where did you pick up the skills for renovation? Sergei: I think God gives skills to people, but as for me, I built my house by myself. I taught myself how to build. I asked people, some people showed me, for example neighbors or friends, and I understood. LB: How many years did it take you to build your home? LB: What would happen if Last Bell offered programs and services, but no relationships? Sergei: It would be hard to have a good influence on their lives. We live with them. We pass through hard times and good times, we can influence them and be together. And our relationship can help them gain experience – of relationships, of work, of what they didn’t know at the orphanage. Our close relationship helps them to be much more responsible in their lives. Watch for stories and video from the Restoration Project, coming soon!